In a perfect world, motorists would get in their car and operate it free from distractions exactly as described in the DMV handbook. 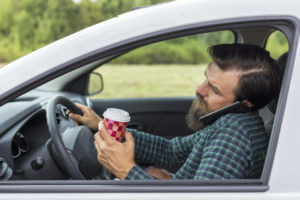 Statistics from the U.S. Department of Transportation suggest that is not what happens because of the tens of thousands of accidents that are caused by distracted driving every year. In observance of Distracted Driving Awareness Month, The Insurance Center would like to highlight the biggest distractions that can lead to an accident. According to statistics from the National Highway Traffic Safety Administration, distracted driving led to 3,166 fatal accidents in 2017 alone. These statistics are even more startling when you consider that motorists traveling on the highway cross the length of a football field in five seconds — roughly the amount of time someone takes to glance at a text message. Calls and texts are just the tip of the iceberg when it comes to accidents related to distracted driving. To help motorists drive more safely, The Insurance Center would like to share the top distractions to avoid when operating a motor vehicle. Motorists should avoid texting while driving because it is the leading cause of distracted driving accidents, but certainly not the only culprit. Fiddling with the radio to find the right station can prevent you from seeing stopped vehicles ahead. Find a station when you are at a complete stop. People place too much attention trying to avoid making a mess when they are eating and drinking in the car. Play it safe by eating when you arrive. Motorists often miss a turn because they were talking to someone in the car, and sometimes swerve the car to not miss their exit. If you are unfamiliar with an area, ask for conversations in the car to be kept at a minimum. Every pet owner knows that dogs can be erratic. More importantly, loud noises can startle your dog and make him seek your protection when you are at the wheel. Consider fastening your companion to a seat or buying him/her a crate. The act of lighting a cigarette, disposing the ashes, and smoking all take your attention away from the road. Your best bet would be to lock away your cigarettes until you are out of the car. These distractions collectively contribute to over 30,000 automobile accidents every year, and some may not even be reflected in reports. The Insurance Center encourages you to be mindful of these common distractions so you can avoid an accident. Call us at 603-542-2551 to make sure your auto coverage policy is completely updated, and we urge you to remind your family and friends to reach out to our experienced insurance agents for coverage they can count on.